Represents the distance from the building's corridor wall to the outside window of the building.The bay depth will be a critical limitation when configuring space for the most efficient use.Because of the waste factor when bay depths result in larger than necessary offices, for example, a building with cheap per-square-foot rental rates but inefficient bay depths may be more expensive than one with higher rental rates but a more compatible design. 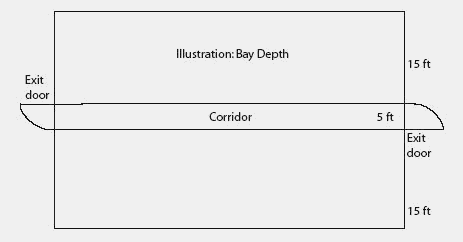 In the diagram, the bay depth is 15 feet. The all-aluminum Quantum trailer from Hackney & Sons fo Washington, NC, provide 44-1/2 inches of bay depth, opposed to 43 inches for standard Hackney units. Keep in mind the wind can greatly affect Florida Bay depths.